The month of November has had lots of twists and turns. 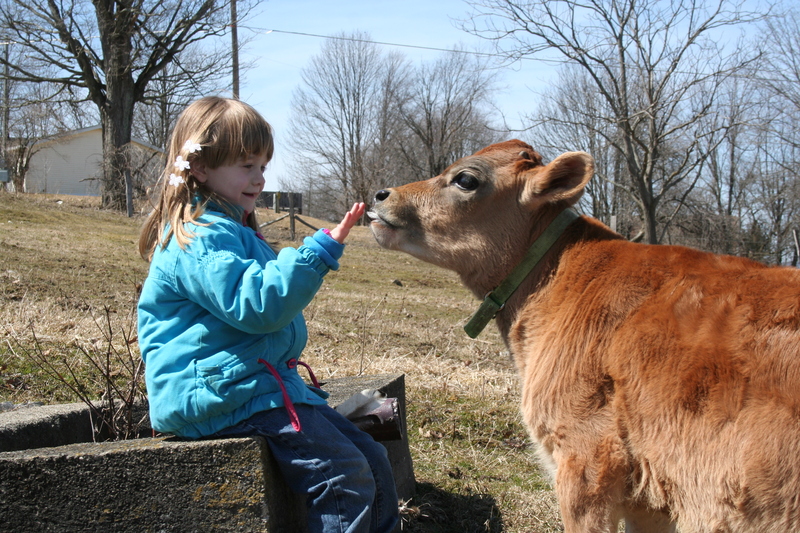 Sometimes when you work in on-farm agriculture, you have to sit back and think about why you do what you do. 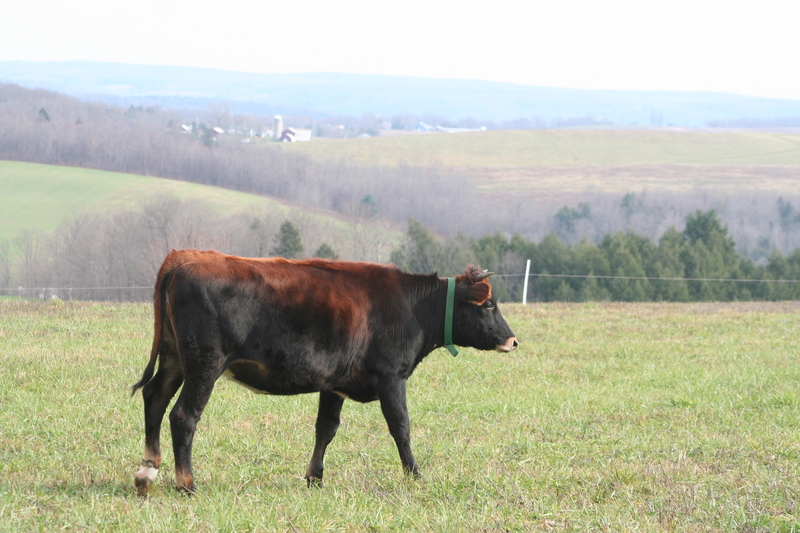 For some it’s the love of the land and doing the best we can to preserve it while making it better and then to others, it’s just the love of cattle, poultry or whatever other animal is on the farm. Today, I want to discuss the cattle end of things. Working with cattle is not an easy job. They have attitudes and temperaments just like a teenager would/does. Then on the flip hand, they don’t trust easily. If they don’t trust you, your job is that much more difficult. Working with cattle is not the job for everyone but those of us that do know how rewarding it is when you love them enough and are patient enough to earn their trust. 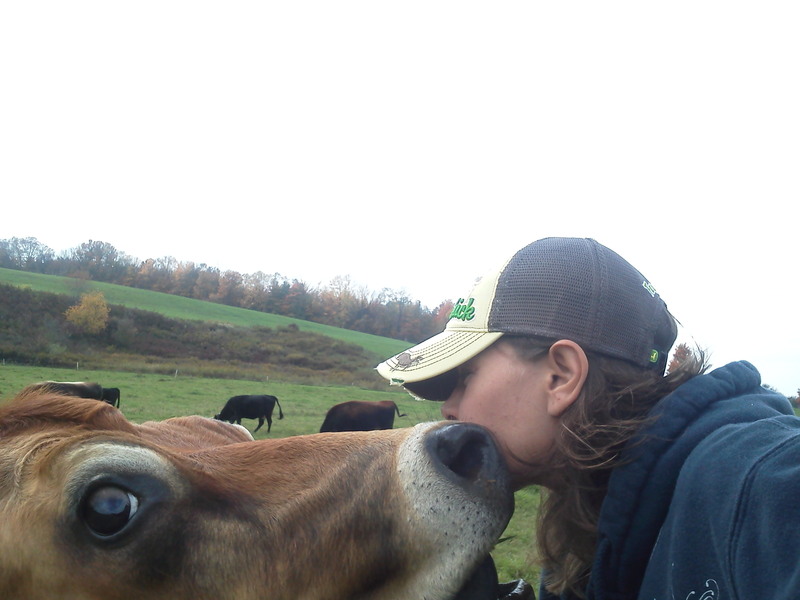 I was inspired to write this blog today after reading the full story of Norma the cow by Dairy Carrie. 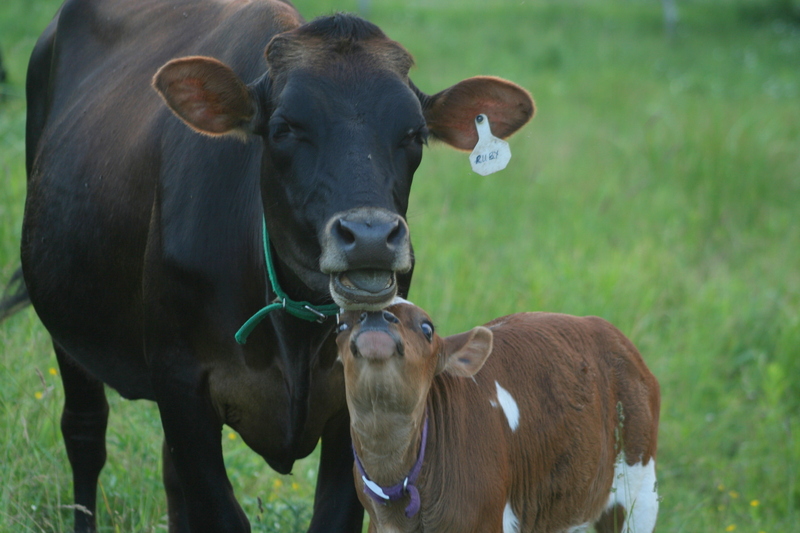 Norma was a special cow to Carrie. Her first cow actually. Please take the time to go read the blog post. 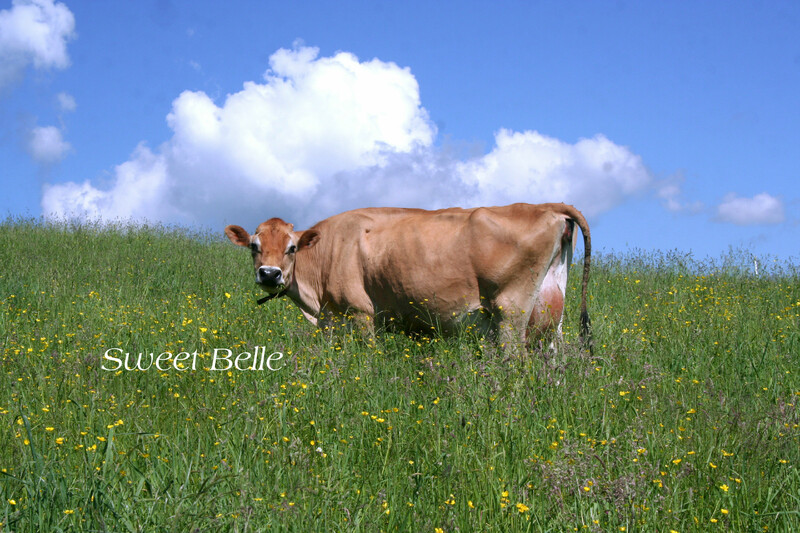 It is an endearing and true testament of a dairy woman’s beginning and learned passions from a single cow. During the blog, she mentions that it took some time for Norma to trust her enough for her to get close to her. As a fellow woman, who has close to the same disposition and passion for animals, I understand the frustration that not being able to truly “care” for an animal can bring. 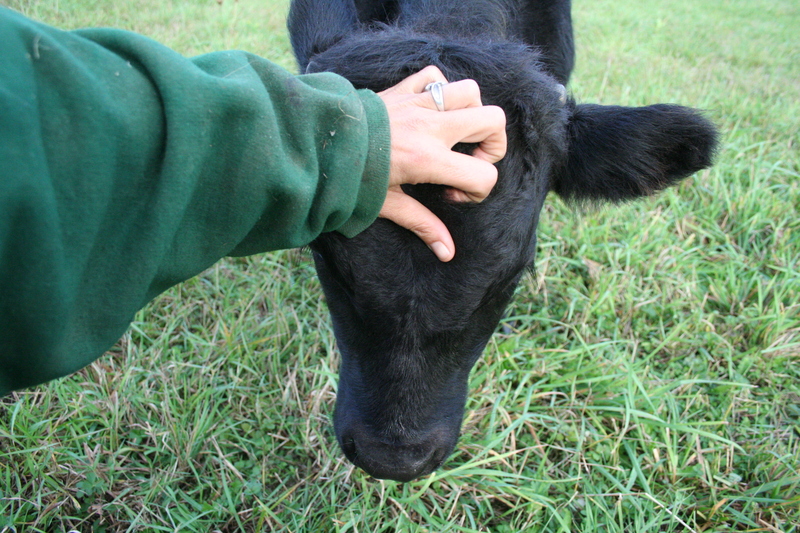 Cattle might be considered a form of pets to some of us, but in reality they aren’t. 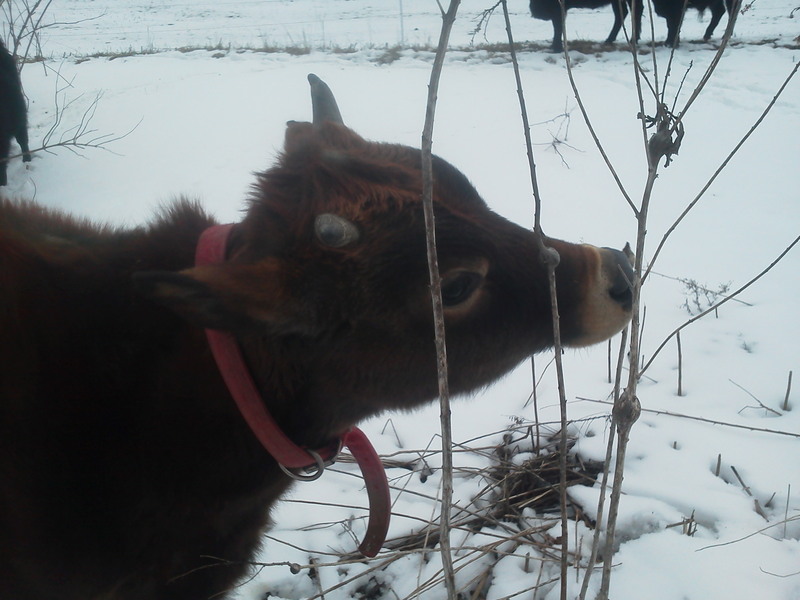 People like Carrie and myself work hard to get our cattle that way…but they still aren’t dogs or cats. 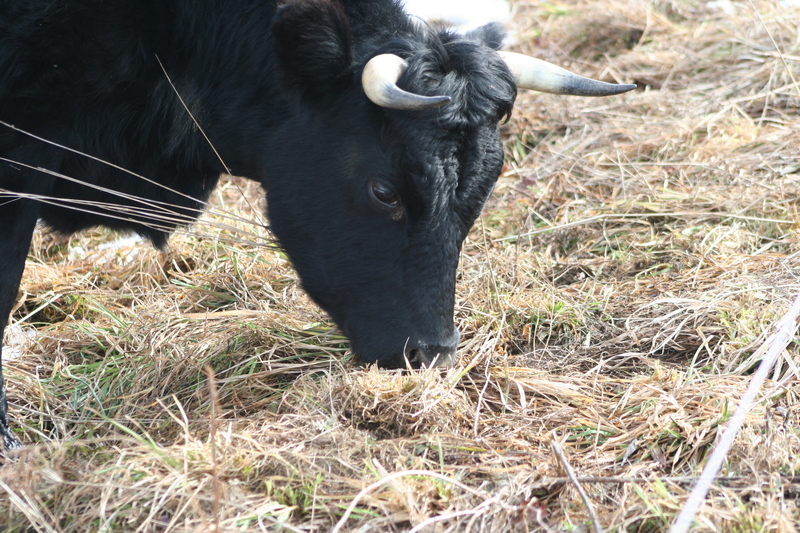 Cattle by nature have a natural flight response to anything different or unusual. They like pattern and routine almost to the point of having what is similar to OCD in humans. Anything not consistent startles them. 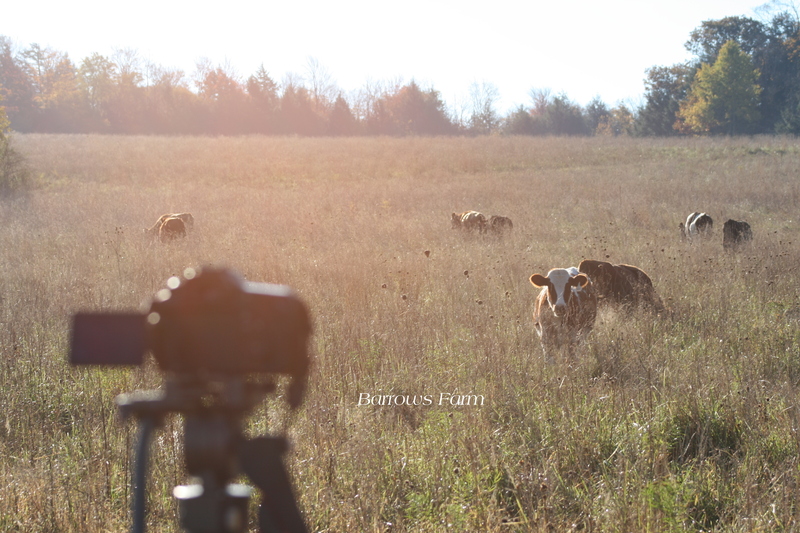 When you move cattle, even to a different pasture paddock, they become full of nervous energy. 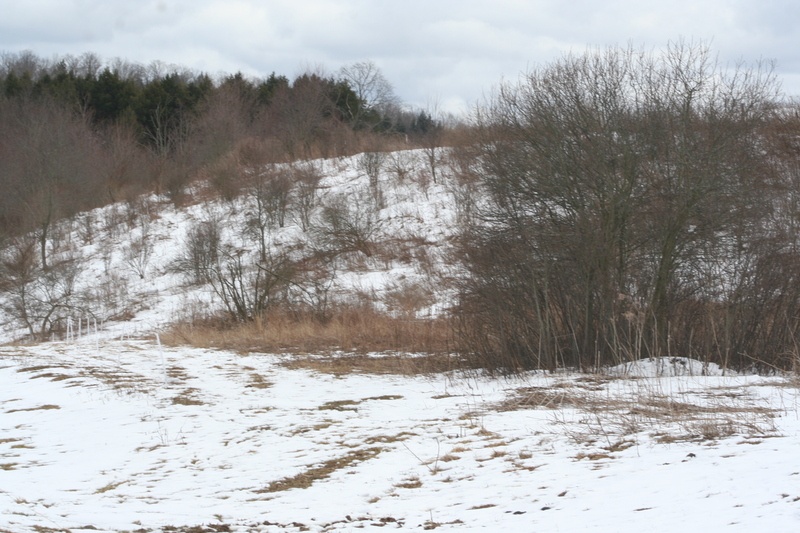 If you change entry ways into pastures or barns, they almost become confused. 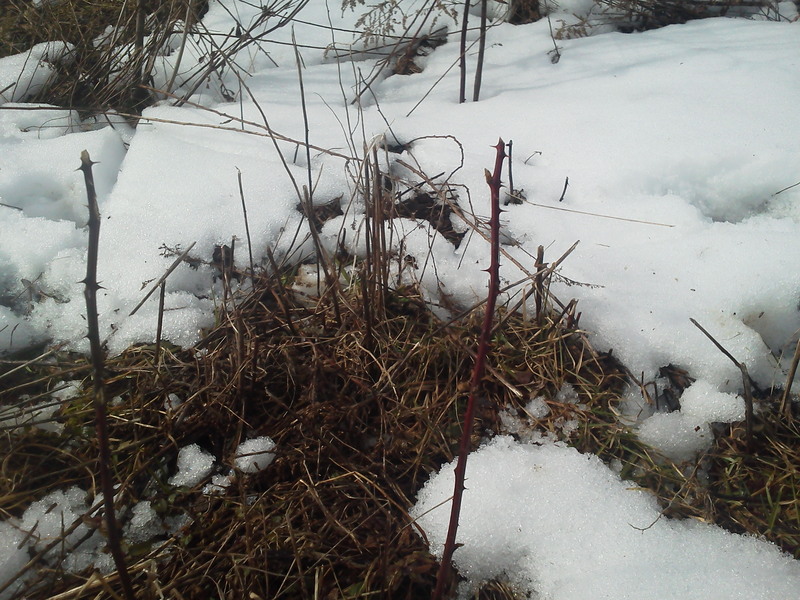 Small things like a piece of grass swaying in the wind, if the wind is higher than normal, can spook them as well. Temple Grandin explains some of these characteristics best. Understanding now that changes can alter how cattle acts and reacts, you can also understand that after purchasing cattle, loading them into a trailer, relocating them into a new environment and also having new people with different mannerisms around can severely affect the “trust” level of cattle. 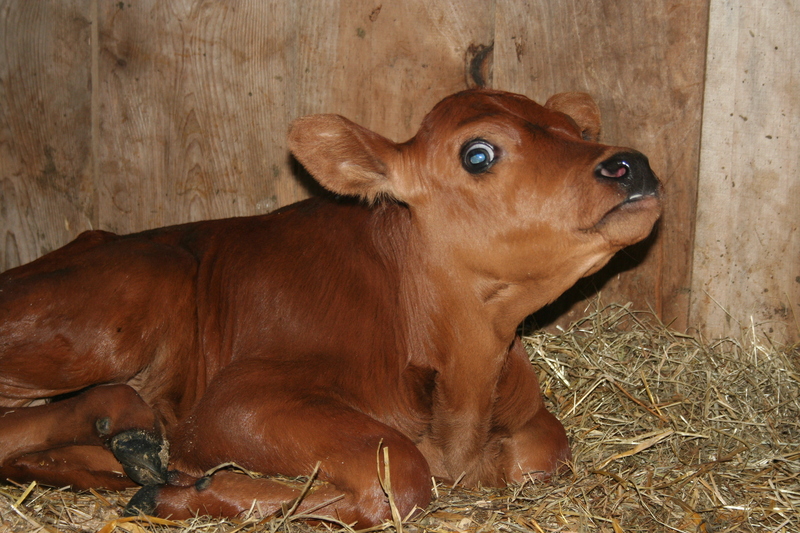 Calves adapt easier than older cows as you can imagine but even in young cattle, there is still a flight response. 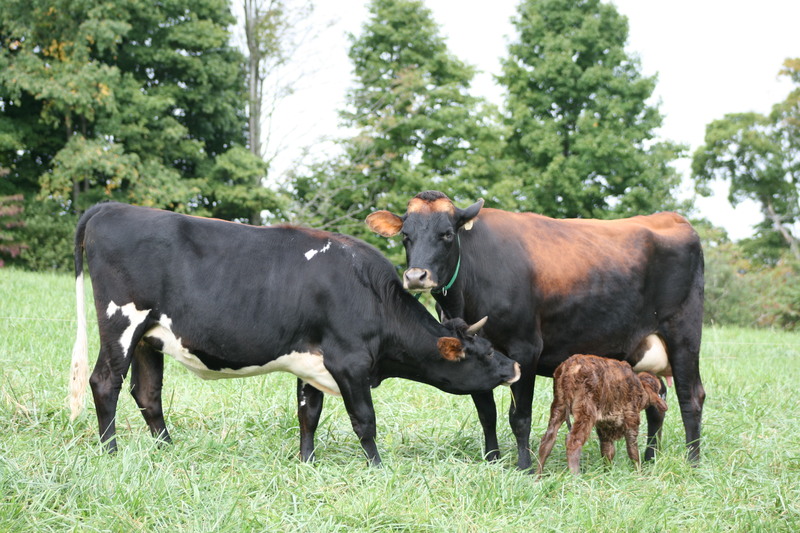 In older cattle the time until the “trust” level is established all depends on the cattle, the environment and the handler. We have two examples here. 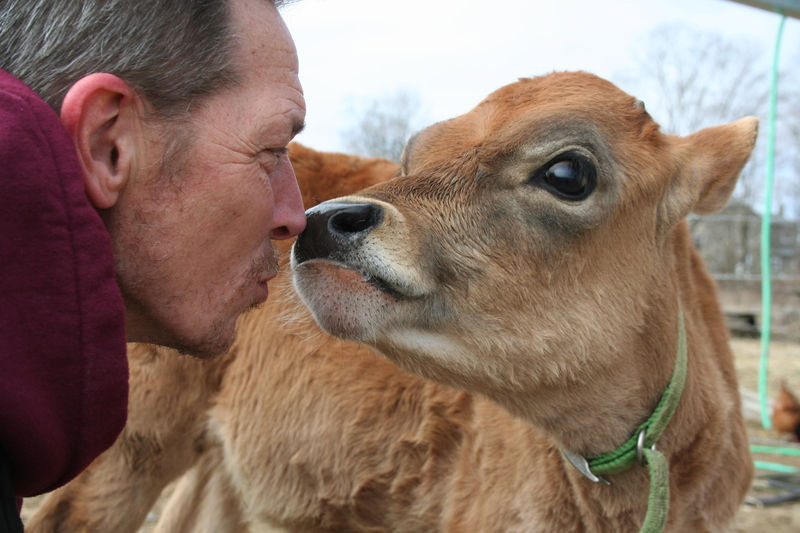 Our Belle, the Jersey rescue, only took a couple of days before she became trusting. After not being fed properly, I think she just innately understood that we transported her to provide her with a better life. She adapted to the barns, the pastures and us extremely quick. Myself and my rescue girl Belle who trusts me and loves me enough to give me kisses. 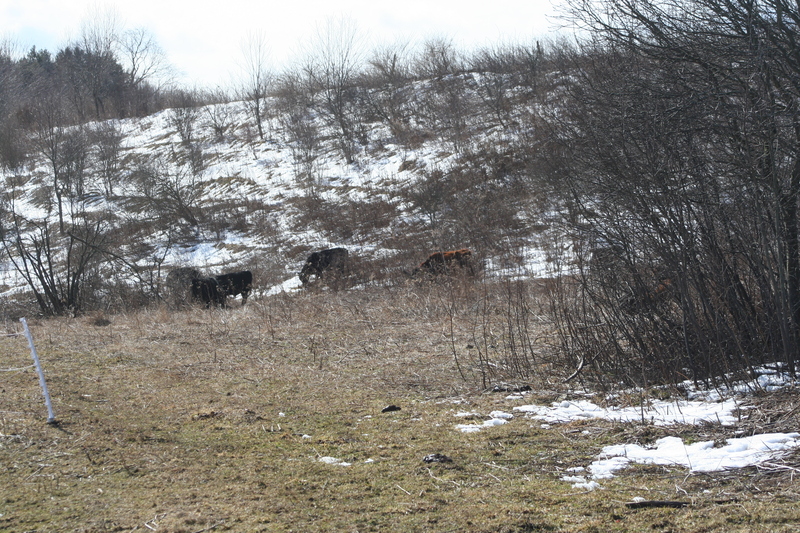 On the other hand, our Dexter Cattle that came to our farm the end of last September still do not trust enough to allow you to walk right up to them in the pasture. They will come to you for treats but you can’t touch them. They do not allow you do scratch the ears, chin or back. If you are really lucky, you might be able to touch a back hip if they are super calm that day. 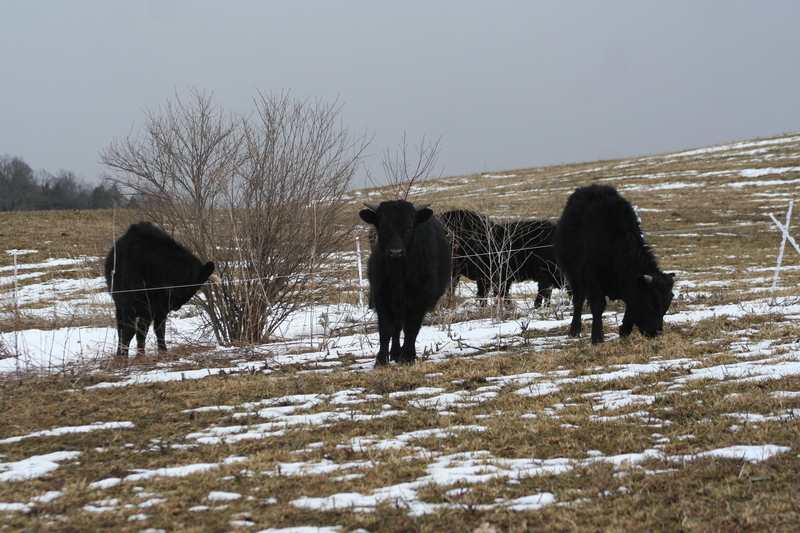 The three calves they had this last spring have also been taught to not “trust”. 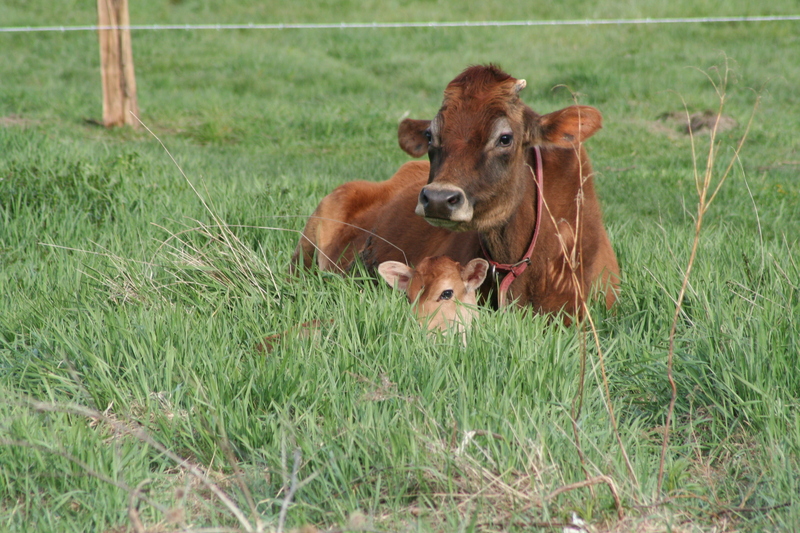 You also cannot just walk up to them in the pasture….BUT if you are patient and kneel down, one of them will come up to have his head and horn buds scratched. You still can’t touch any further back than the base of his neck and you can never touch his legs. 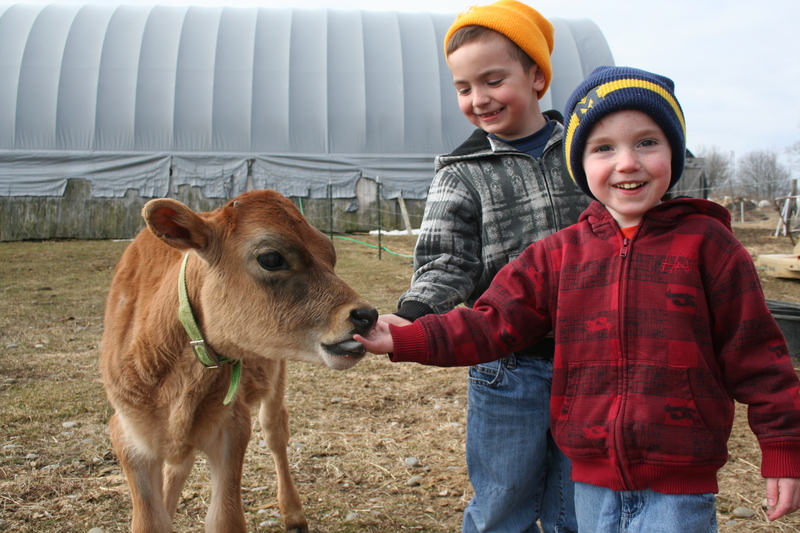 The Dexter cows will come up to take treats from your hand but any type of movement or noise shoots them off in the opposite direction. I will admit…after almost a year of waiting for them to just trust me enough to get within reaching distance, I am elated to have them come to me for treats now. If I go out and sit in the pasture, they will come stand next to me instead of automatically running the opposite direction. Every time they do get close enough to touch which I don’t even attempt (remember: I am trying to earn their trust), I can’t keep the smile from my face. Just imagine not having any human contact for your whole life…and then all the sudden there is a person that wants to spend time with you. What kinds of reactions do you think you would have? Cattle are big and potentially dangerous. 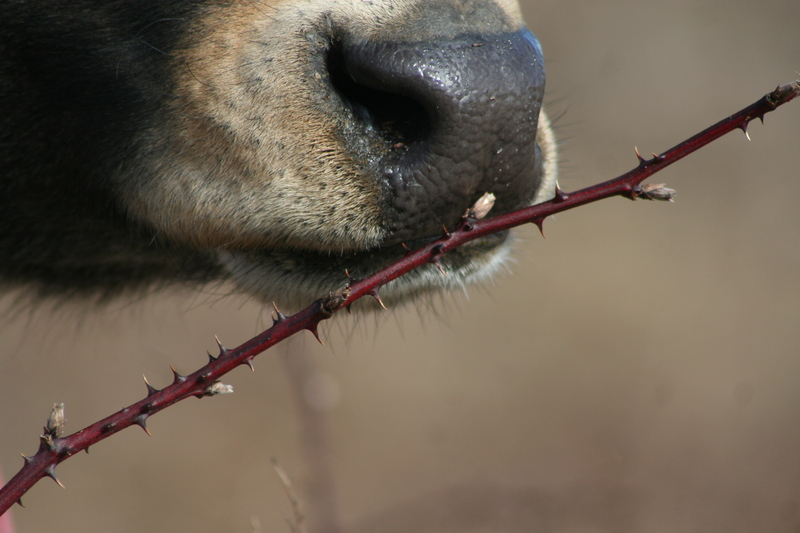 BUT to those of us that are lucky enough to earn their respect…we know just how gentle and loving they can be! 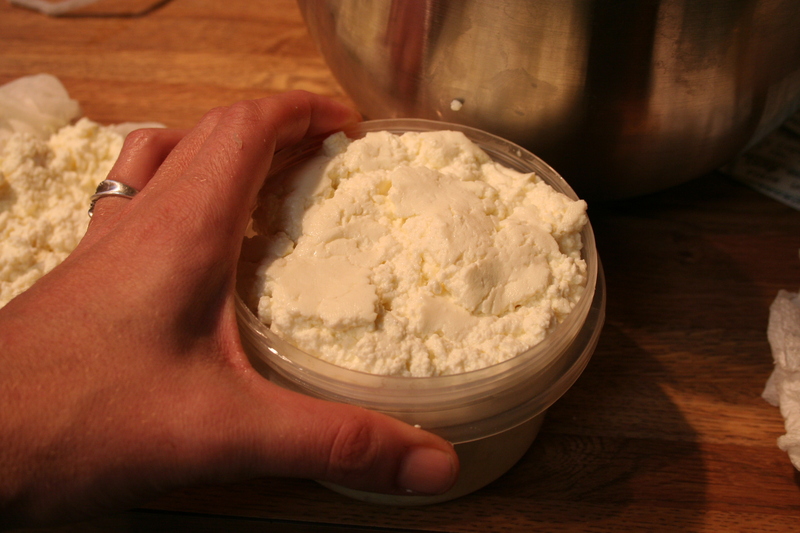 Okay, I finally managed to get some photos of the whole process of making Ricotta cheese. 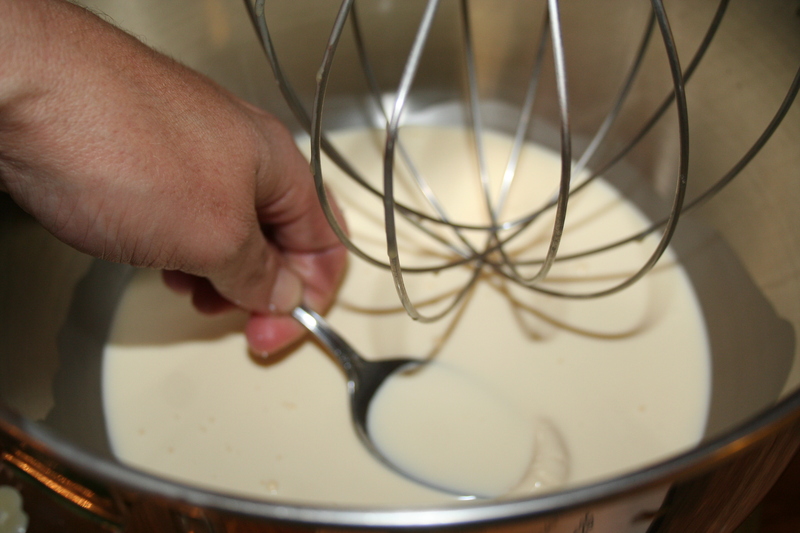 This is one of the simplest and easy cheeses to make…and you can show off your kitchen skills with this quick and easy transformation of milk into something yummy for a dish to pass or the next family gathering. First, we are going to start off with a large pot. I prefer a heavy bottom stainless. 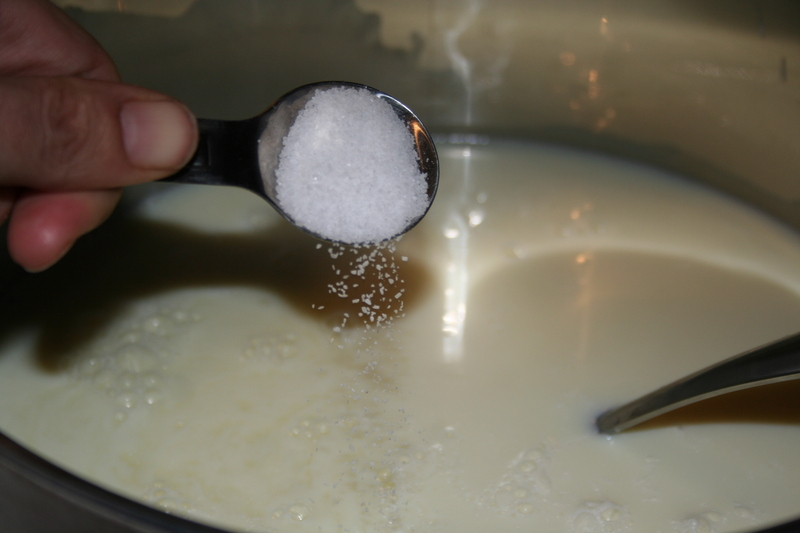 Next you need a gallon of milk. 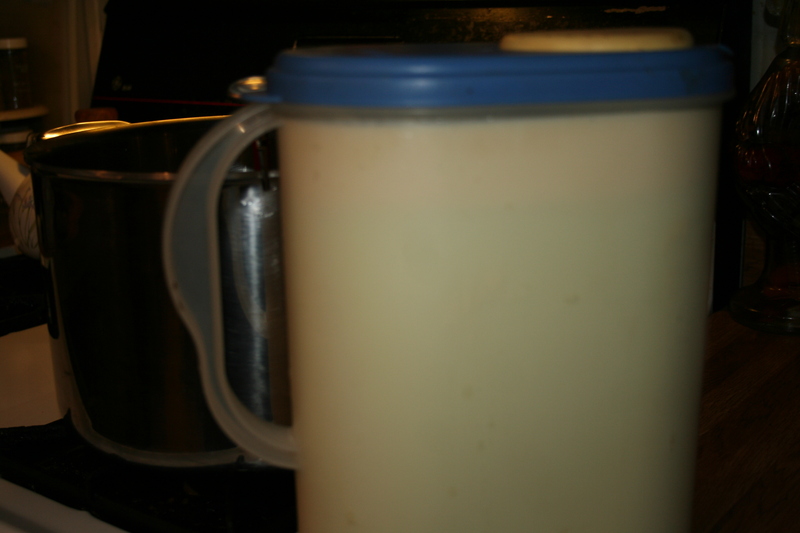 Since I milk my Jersey cow (Belle) twice a day, I have fresh milk. 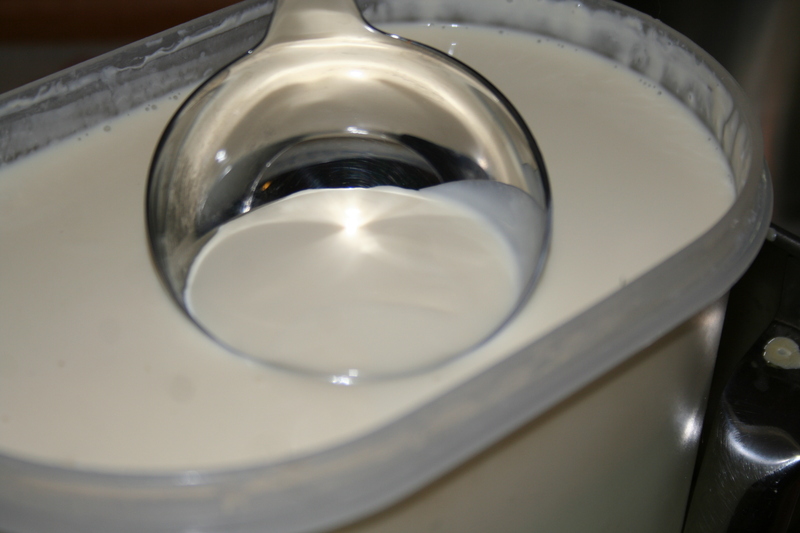 If you look closely, you will see the cream line on the top of the milk. 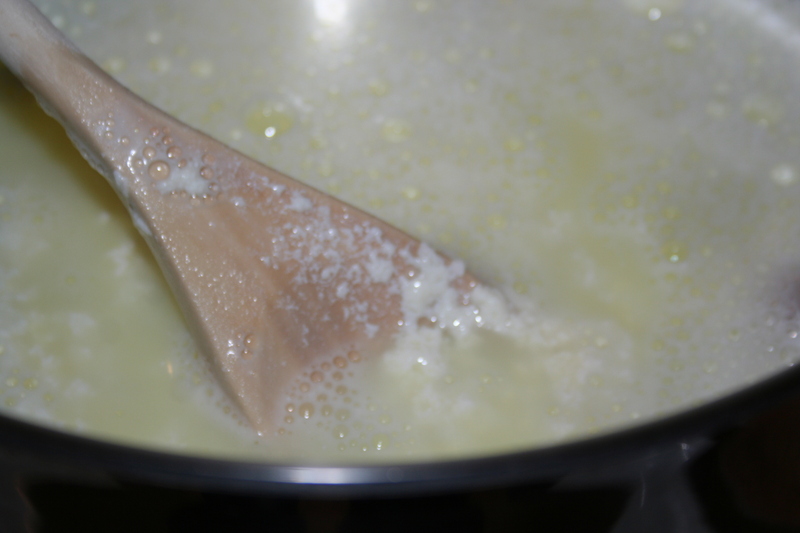 Since I want to make whole milk ricotta, butter and also buttermilk cheese (as seen in previous posts), I am going to skim about 1/2 of the cream off the top of the milk. I set this aside in my kitchen aid bowl to warm to room temperature. I am going to use a bit of this cream later. 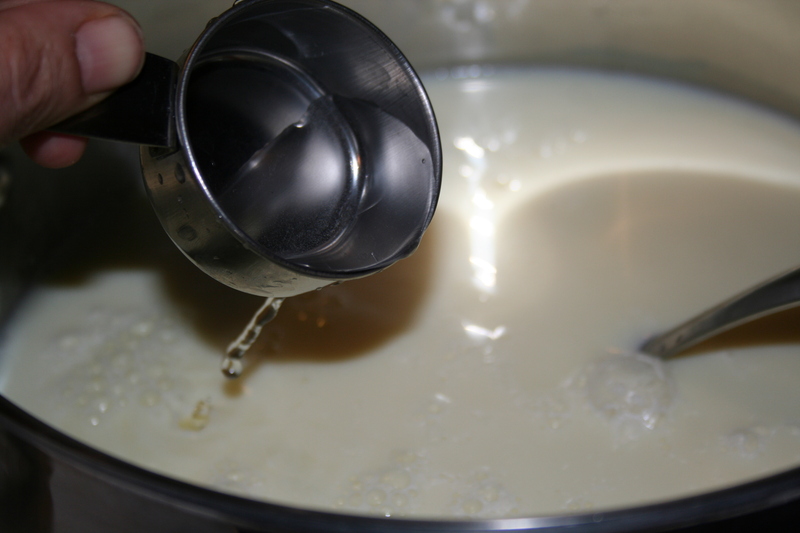 Add cold milk to pot. 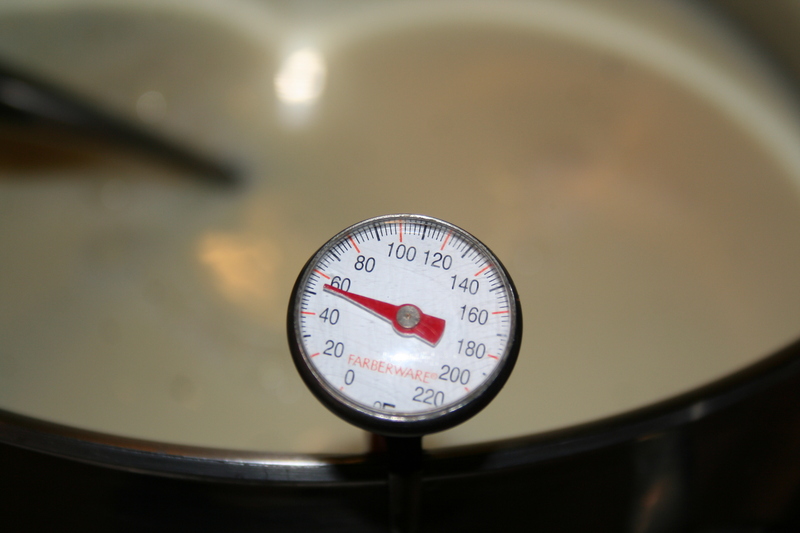 There is no need to warm the milk to room temperature. 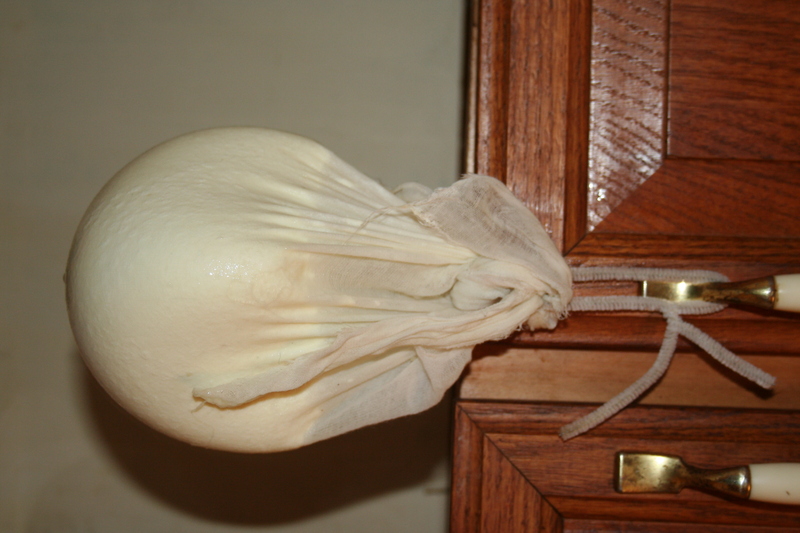 If you prefer a soured taste to your Ricotta cheese, then you need to allow it to come to room temperature before proceeding to next steps. 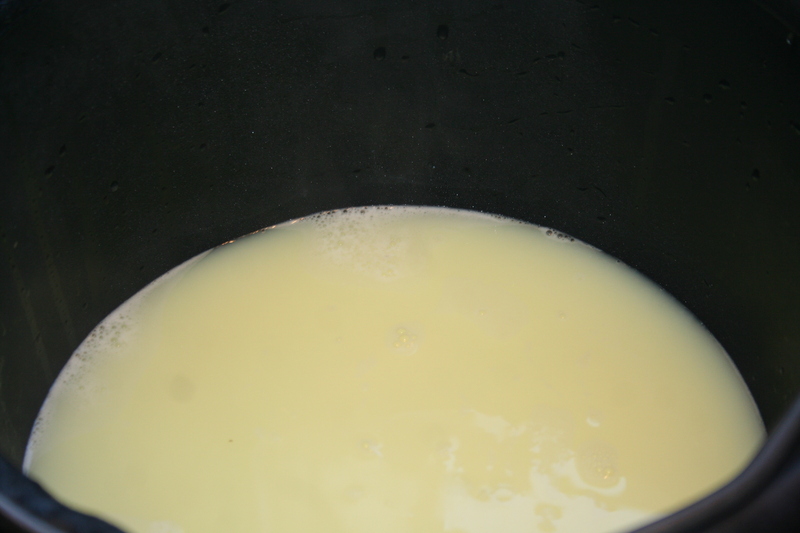 Once the milk has broken apart into the curds and whey, shut off the heat and allow to sit for 10 minutes. 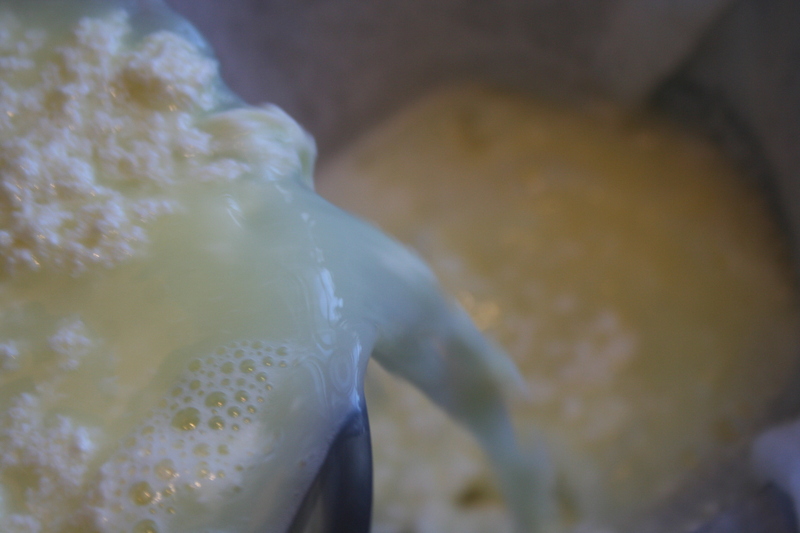 While the cheese is setting, it is time to get ready for the draining process. 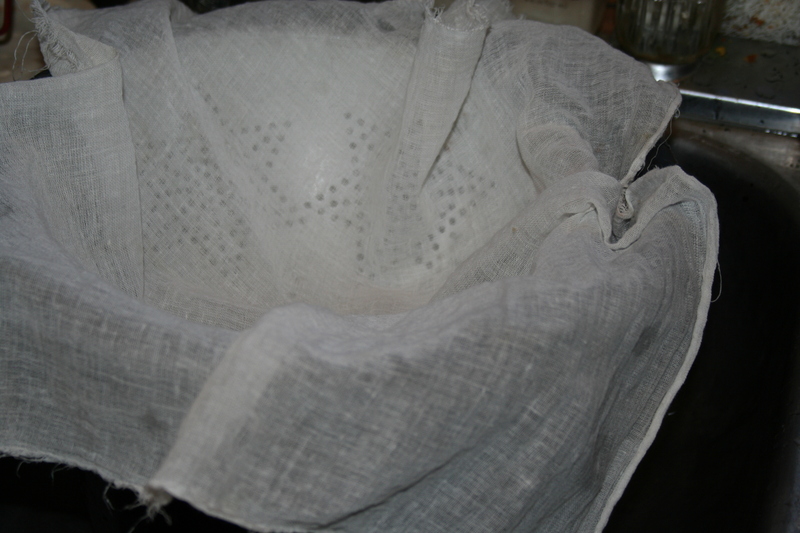 Line a colander with butter muslin. Note that I use a bucket because I feed the whey to the chickens. 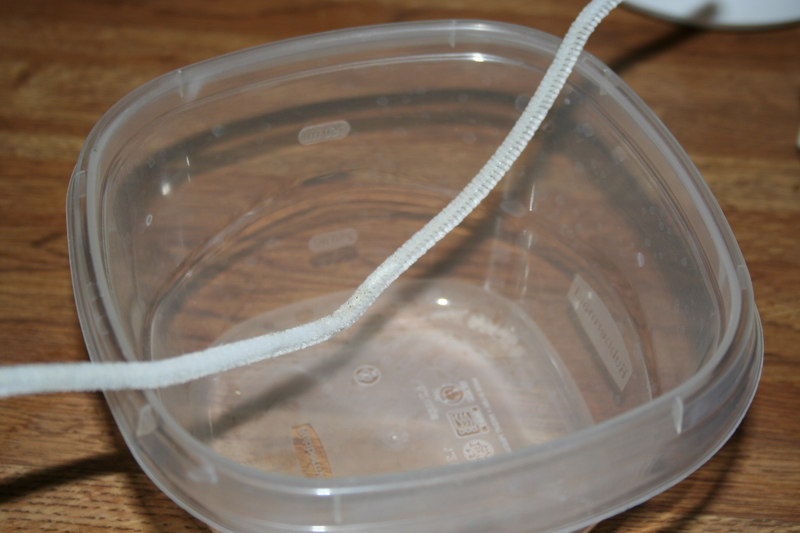 Using a cupboard door handle, hang and allow to drain for about 1/2 hour. I take my bucket of whey to the chickens now. Store in 1 lb. containers. 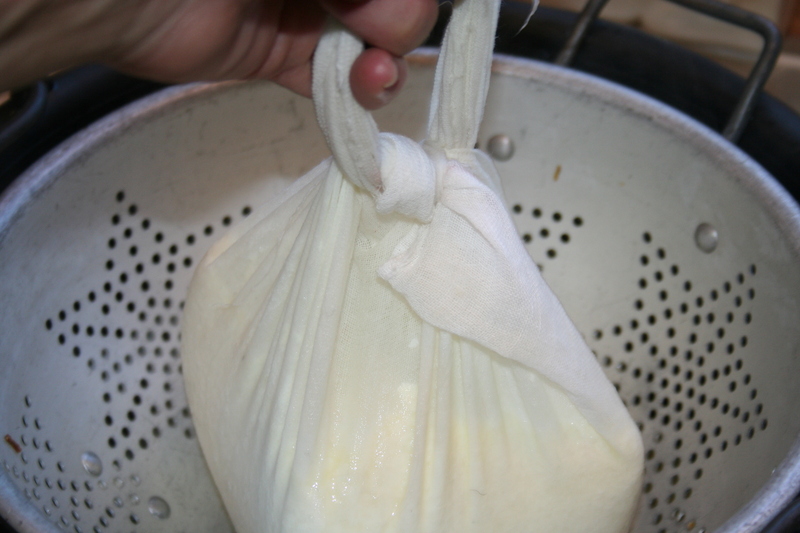 You can store the finished cheese in the fridge for a week or so but it also freezes rather nicely. 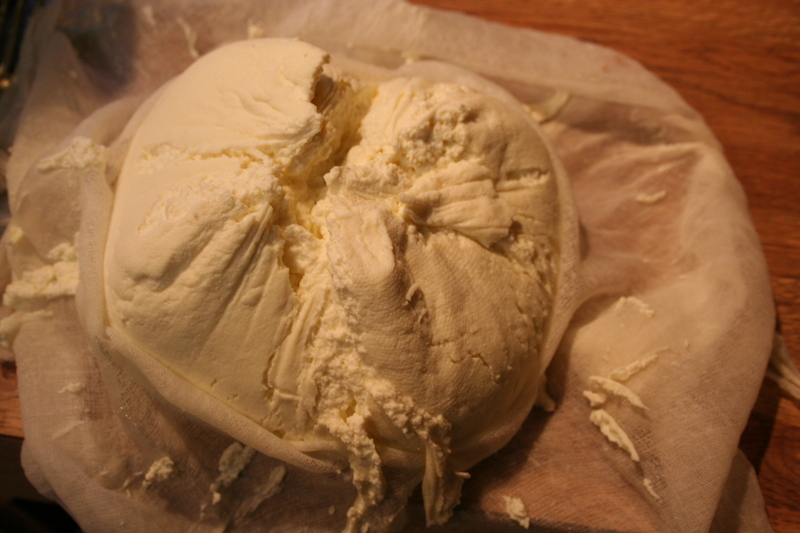 One recommendation: If you are going to freeze your cheese, do not add the cream. 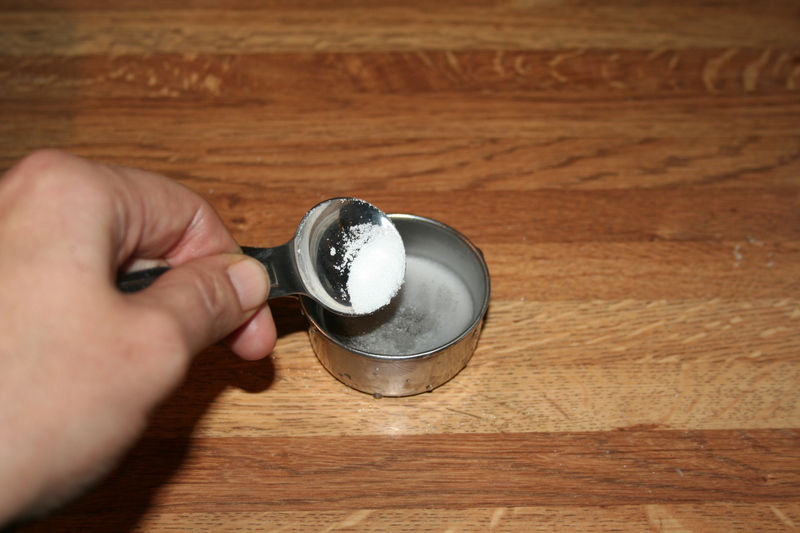 Add it once you have thawed it for you or just leave it out completely. 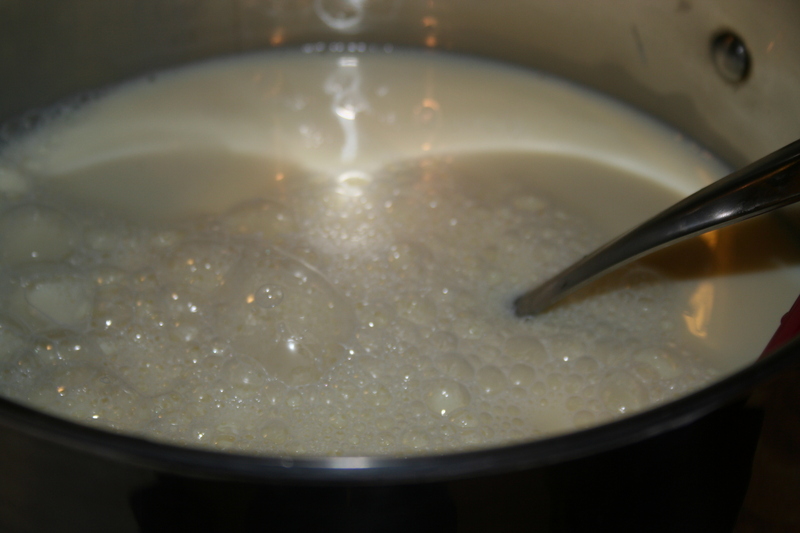 Add a drizzle of maple syrup, mix completely. Pour into a 9-inch baking dish and bake at 350 degrees F for about 40 minutes or until top turns golden brown. Serve with fresh fruits like strawberries or blueberries. All are cooked exactly as above. Hope you enjoy and would love to hear about any attempts or results. If you have any issues, feel free to let me know and I will help trouble shoot the issue.